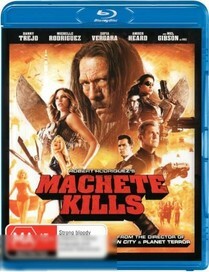 Synopsis: Machete (Danny Trejo) is back in Robert Rodriguez's Machete Kills and this time on the right side of the law. Recruited by the President of the United States, Machete is given a mission that would be impossible for any mortal man. He must take down an eccentric billionaire arms dealer who has hatched a plan to spread war and anarchy across the planet. With a bounty on his head, Machete breaks all the rules as he is hunted at every turn by an all-star cast of deadly assassins.